At Double X Science Emily Willingham looks at the origins of today's turkeys, whose wild ancestors were carried from Mexico, to Europe and back again to North America. Image: Turkey by wattpublishing on Flickr (www.WATTAgNet.com), shared under a CC-By-2.0 license. • Turkey trouble: Genetics gone too far? All of this raises the obvious ethical question. 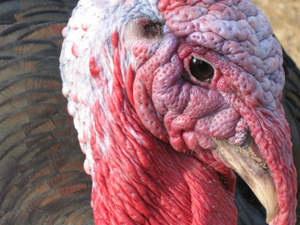 Just because we can breed this turkey, should we? The turkey lives a short, miserable life but we get an affordable, healthy source of protein. It is obvious which choice we’ve made as a society, but is it the right one? A bit sobering to think about. Gizmodo asked NASA engineers and science writers how they would use NASA's high tech equipment to cook a turkey. If you have a spare satellite dish or an Antares-class sounding rocket you could try out their recipes yourself! The astronauts on the International Space Station will be celebrating Thanksgiving with a holiday meal that includes irradiated smoked turkey and themo-stabilized yams - yum!. Even though it comes freeze dried and in foil packets it's still a special treat. You can even follow NASA's recipe for cornbread stuffing if you want to eat like the astronauts do.